I know, I know, we call them biscuits here in Australia, but seeing as these two books I have to giveaway are printed overseas we'll all just have to live with me calling them cookies for now. 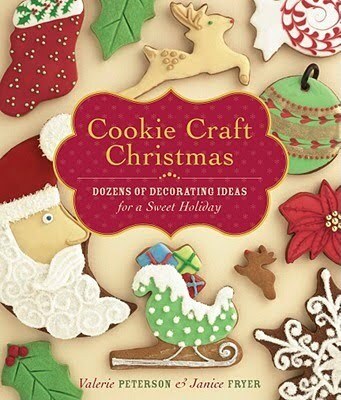 So, about a month ago I posted about this fabulous book I'd come across at work, Cookie Craft Christmas. It's a great little book and you can read a little more about it here. I have managed to get my hands on a copy and I am going to give it away! Yes, that's right dear readers, if you live in Australia and you love to bake, then you have a chance to win this book! I'm also chucking in a copy of Cookies for Christmas from FamilyFun Magazine. 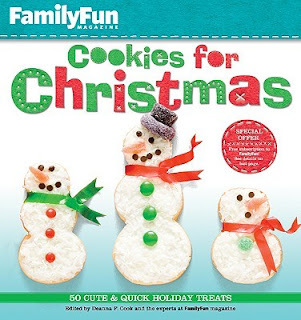 This one features 50 cute & quick holiday treats to make and it's perfect for busy parents as each recipe is simple to make and there are steps included for the kids so you can turn the baking into a family activity. Together the books are worth $42 RRP but you can have them for free! How do I get them for free you ask? Enter the giveaway. All you need to do is leave me a comment and you'll get one entry in the draw. If you do a quick blog post about my giveaway on your blog and let me know about it, you'll get another entry in the draw. If you re-tweet details of the giveaway I'll give you yet ANOTHER entry in the draw. So that's a potential 3 entries! Entries close next Friday 4th December and I'll announce the winner here on Sunday 6th December. If you are the winner I will contact you via email to get your address details so I can get them to you with plenty of time to make some of these treats before Christmas Day. So what are you waiting for? Get commenting! P.S I apologise to anyone living outside of Aust who would like the chance to win these books. Being a month out from Christmas there's just no way I'd be able to get them to you before December 25th without spending more than the books are worth on postage. i definitely like this, thanks Mrs P! Woo Hoo! count me in! LURVE baking!! Oh - sigh, swwon, gush. I heart those books. I heart Christmas baking, I heart giveaways! I'd love to enter your giveaway too. I will post about this tomorrow on my blog. Thanks!! I love baking cookies! Please enter me in the giveaway. WoW! sounds like a superb offer. I'd love to grab a copy of this fantastic book. Keep up the good work and thank you following my blog. Oh, me please! I'm so desperate for some new cookie recipes for the kids to try!! Excellent giveaway! These look like so much fun! =) Awesome giveaway! What beautiful cookies! Perfect to send to my in-laws! awesome giveaway!i love cookie decorated you are greatttt!!! :) thanks!